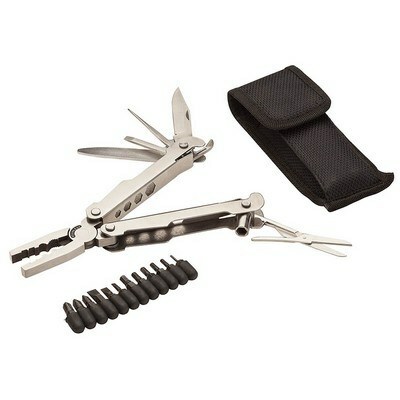 Conveniently store the tool in the included nylon belt pouch with hook and loop closure. The multifunction tool makes it easy to carry a whole toolbox in one convenient tool. This Multi-Function Pliers features a wire cutter, 2-1/4" knife, serrated knife, double-tooth saw, double-sided file, two flathead screwdrivers, Phillips screwdriver, can opener, bottle opener and scraper blade. You can easily insert your brand details to create customized giveaways for promotional events.